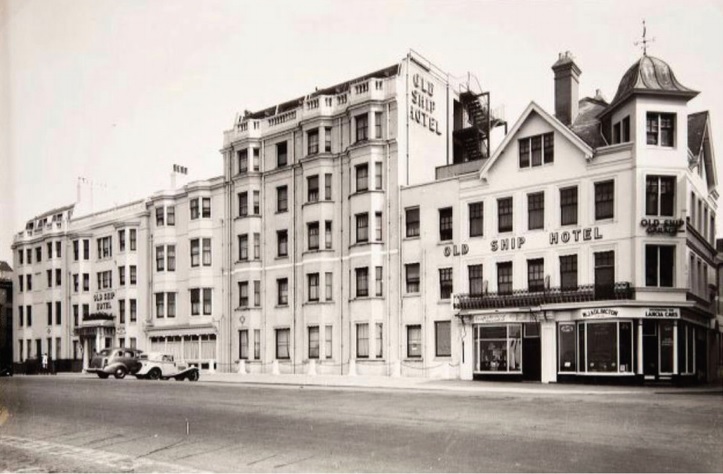 The owners of the 17th century Old Ship Hotel on Brighton seafront are planning more extensions to boost the number of rooms and add new shops and a swimming pool. 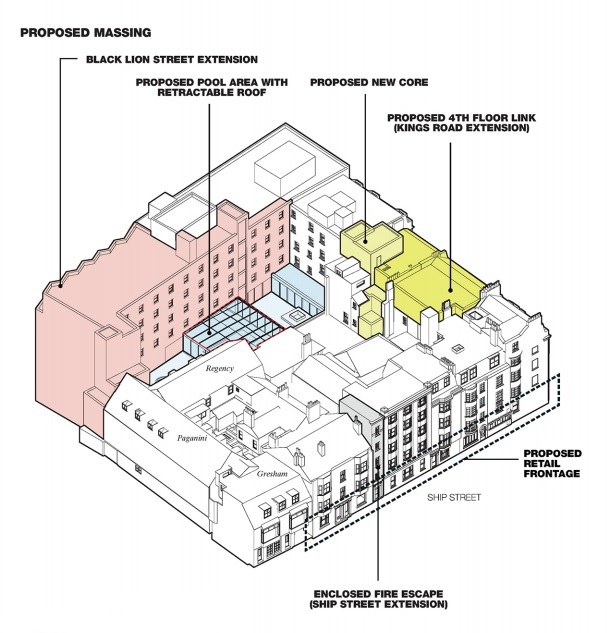 The scheme will add 54 new rooms in one extension in Black Lion Street and four more new rooms as part of a fourth floor extension linking the hotel’s two wings. The internal courtyard will also be reconfigured to include a swimming pool fitted with a retractable glass roof alongside a health club. The Grade II* listed assembly rooms to the north of the site will be preserved and enhanced. Under the plans, the garage in Black Lion Street will be demolished and a new six storey building put in its place. A new floor will be built on the middle section of the Kings Road frontage to bring it to the same height as the buildings on either side. The fire exit on the Ship Street frontage will be enclosed and new shops put in along the ground floor. The listed Paganini room, part of the assembly rooms, will be repurposed as a “state of the art facility”. The site has had a hotel on it since at least 1559, when the Shippe Inn in Ship Street was recorded there. In 1650, it became known as The Old Ship Inn and in 1703, it gained sea views when buildings at the bottom of Ship Street were swept away. After sea defences were constructed in 1723, a series of bow-windowed houses were built facing the sea, two of which became part of the hotel in 1836. The current entrance stands between these two houses. The Bacon family bought the hotel in 1852 and ran it for the next 147 years, during which time two more houses on the Kings Road became part of the hotel. In the 1960s, the section on the corner of Kings Road and Black Lion Street was demolished and the current building was built four years later. In 1995, a series of smugglers’ tunnels were found in the basement. These now house private dining and wine cellars. A shame that the section to the east was demolished in the Sixties.